Around 2006 McDonalds restaurants ran a Postman Pat give away promotion with children’s meals. The Postman Pat figure from the McDonalds promotion is identifiable by the following maker’s mark ‘2006 ER PLC Original writer John Cunlittle Lic RMG PLC. Made for MCD’S Corp.2005’. This 3″ scale Pat has one hand raised. The other hand is articulated at the shoulder and has a letter ready to deliver. 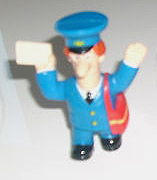 The McDonalds Postman Pat toy figure has a red mailbag over Pat’s shoulder. The legs and feet are fixed in a walking pose. 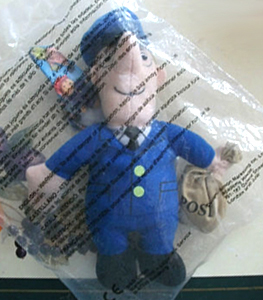 In 2001 McDonalds also gave away a plush beanie type Postman Pat with post sack. These were 6 3/4″ scale and originally came sealed in a plastic bag.